John Baskerville (1706-1775) was forty-four when he gave up engraving to establish his own printing business. He developed a beautiful typeface and new recipes for ink. To print his delicate new font, Baskerville needed a “kiss impression,” that is, a clean image on the paper made with the least amount of pressure possible from the plate. This required a smooth, uniform surface and so, Baskerville had James Whatman the Elder (1702-1759) refine his paper moulds and papermaking process to create such a paper. The first book to use Baskerville’s refined type and Whatman’s new wove paper was a book of Virgil’s poetry published in 1757. 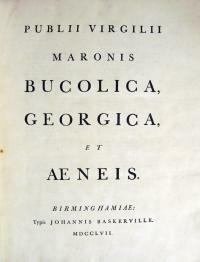 Virgil, Publii Virgilii Maronis Bucolica, Georgica, et Aeneis (Birminghamiae: Typis Johannis Baskerville, 1757 [i.e. 1771]). 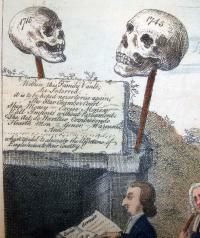 Graphic Arts Collection (GAX) Baskerville 1771. Gift of Archibald S. Alexander, Class of 1928. For whatever reason, part of the Virgil was printed with laid and part with these new wove papers. 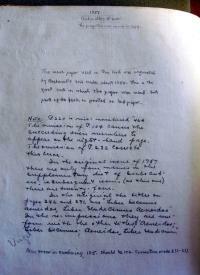 Click on the image of a page of notes above to see laid paper. 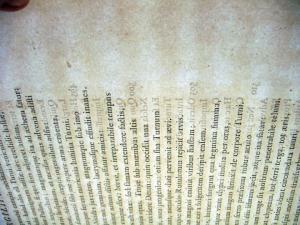 Then, click on the text page below, from further into the volume, to see an example of wove paper. As my predecessor Dale Roylance pointed out, Baskerville “created 54 of the most beautifully printed books in the English language.” In 1981, the graphic arts collection was the grateful recipient of 43 of Baskerville’s 54 books, given by Archibald S. Alexander, class of 1928. In total, Princeton now holds six copies of the first edition of the Baskerville Virgil, along with five of the second edition including two in the graphic arts Baskerville collection. Note, Philip Gaskell’s bibliography of Baskerville books has been updated, at least concerning his Virgils, by Craig Kallendorf in his A Catalogue of the Junius Spencer Morgan Collection of Virgil in the Princeton University Library (New Castle, Del. 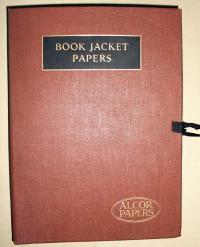 : Oak Knoll Press, 2009) Classics Collection (Clas). Firestone Oversize Z8932 .K36 2009q. 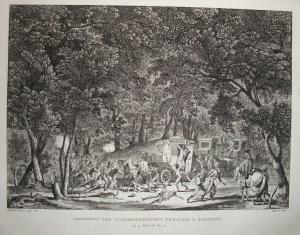 Graphic Arts is fortunate to hold an extra-illustrated edition of Symonds’ book that includes 140 original prints in addition to the 200 reproductions printed within the text. Here are a few examples. James Gillray (1756-1815), Breathing a vein, 1804. Etching. 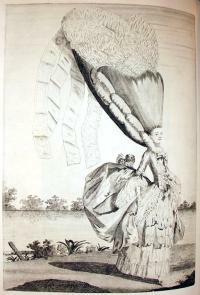 Matthew Darly (ca.1720-1781 or later), Chloe’s cushion or the cork rump, 1777. Engraving. 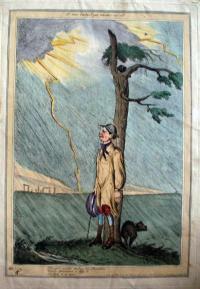 Charles Williams (1797-1830) after a design by George Moutard Woodward (1797-1830), Cure for a Smoky Chimney, 1808. Etching. Joshua Kirby Baldrey (1754-1828), The Struggle, for a Bengal butcher and an imp-pie, 1788. Etching. 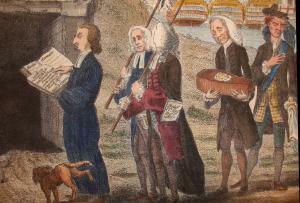 Hastings holding a large pie; on the right are Thurlow and the Devil. 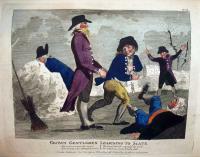 Grown Gentlemen learning to skate, 1794. Engraving. 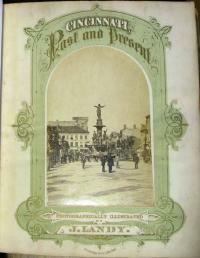 Published by John Evans and Thomas Prattent, London. “Alas what various ills await / The booby who attempts to skate…”. 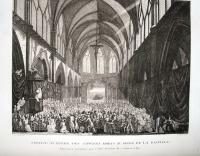 Collection complete des Tableaux historiques de la Révolution française, en deux volumes: … (Paris, de L’imprimerie de Pierre Didot L’Aîné An VI de la Republique française, 1798). 144 engravings. Graphic Arts GA2010- in process. The French painter and draftsman, Jean Louis Prieur, the younger (1759-1795) is principally known for his drawings, a few shown here, of the French revolution. 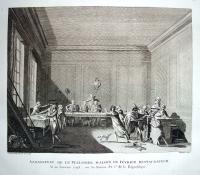 Engraved by Pierre Gabriel Berthault (ca. 1748-ca. 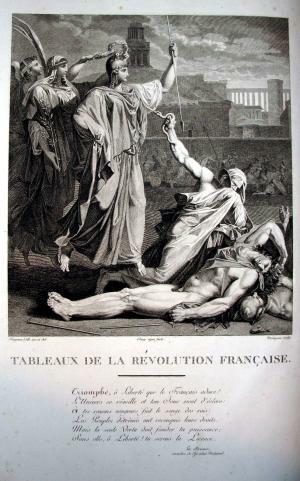 1819) these images were published by L’imprimerie de Pierre Didot in several editions under the title Collection complete des Tableaux historiques de la Révolution française. 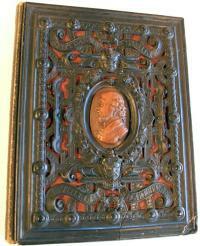 They sold originally in sets of two for six livres each and in 1802, a three-volume deluxe edition was published that included portraits. Like Gardner’s Photographic Sketch Book of the Civil War in the next generation, Prieur and several other artists created these images from 1789 to 1792 as the revolution was taking place. 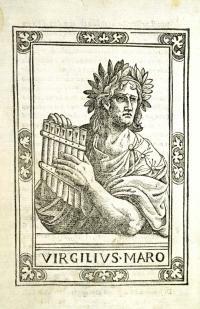 In the final volumes, the engravings are each accompanied by extensive commentaries written by Sébastien Roche Nicolas de Chamfort and Abbé Claude Fauchet. For more information, see Amy Freund, “The Legislative Body: Print Portraits of the National Assembly, 1789-1791,” Eighteenth-Century Studies 41, no. 3 (Spring 2008): 337-58. 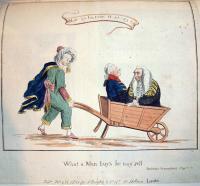 William Heath (1795-1840), The Man Wots Got the Whip Hand of ‘Em All, 1829. Hand-colored etching. Graphic Arts British Caricature. When Heath returned to London in 1827, he began signing his prints with a drawing of the actor Liston in the role of Paul Pry from John Poole’s 1825 comedy. However the signature (and his engaging designs) attracted so many plagiarists that Heath was forced to abandon it in 1829. 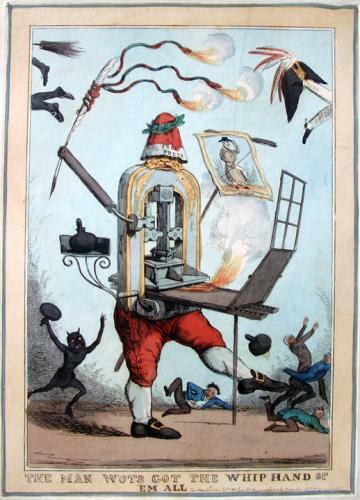 Among the prints that attracted so much attention in the spring of 1829 were a series of satires on the question of Catholic emancipation featuring King George IV, Prime Minister Wellington, and Lords Eldon and Brougham. Titles included The Slap-Up Swell Wot Drives When Ever He Likes, The Guard Wot Looks After the Sovereign, The Man Wot Drives the Opposition, The Cad Wots Been Appointed Rat-Catcher to the Sovereign, and The Man Wot’s Been Made Foreman to the British, among others. 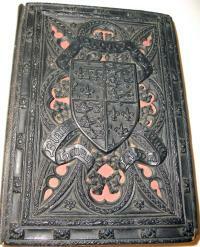 This print, The Man Wots Got the Whip Hand of ‘Em All, depicts a Stanhope Press with the legs of King George. 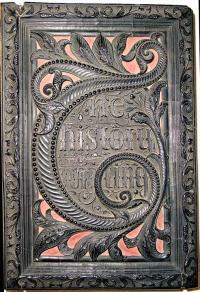 It wears a cap of Liberty inscribed Free Press and holds a giant pen with fire-spitting serpents. 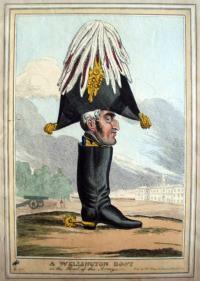 Prime Minister Wellington’s departing legs and hat are seen at the top right, while the legs and buckled shoes of Lord Eldon are seen at the left. 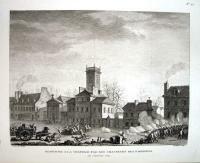 A print titled The Man Wot Drives the Sovereign (another by Heath) is about to be burned by the flames of the ‘free press.’ Note the printer’s devil with an ink ball bottom lower left. The Graphic Arts division several dozen prints by Heath, along with his illustrated books. Here are a few others. Cooper designed this political cartoon in response to Woodrow Wilson (1856-1924) and his 1913 “triple wall of privilege,” which sought to reorganize the tariffs, the banks, and the trusts in the United States. During the first year of his presidency, Wilson proposed the Underwood Tariff Bill to help lower the general rate from about 40% to 26%. This led to the first American income tax, based on a graduated scale that started on incomes over $3000. Wilson also put into place the Federal Reserve Act, with a Federal Reserve Bank in each of twelve regions. 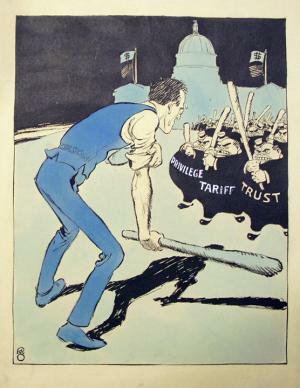 Finally, he focused on the reorganization of trusts and after much convincing, the Clayton Anti-Trust Act of 1914 was passed banning price discrimination. Fred G. Cooper was born in Oregon and educated at the Mark Hopkins Art Institute in San Francisco, before moving to New York City in 1904 to find work as a freelance artist. 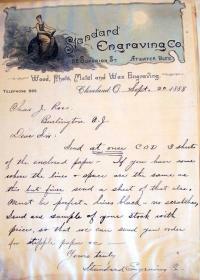 He created designs for New York Edison (or ConEd), Westinghouse, and the U.S. War Department, among many others. This cartoon was probably for Life magazine, where he contributed drawings from 1904 to the 1930’s, although I have not yet found the issue. British painter Joseph Wright of Derby is best known for two oil paintings, A Philosopher Giving a Lecture on the Orrery in which a Lamp is put in Place of the Sun (ca. 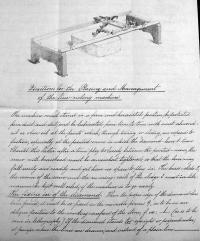 1764-1766) and Experiment on a Bird in the Air Pump (1768). Each employs a strong, realistic light source to produce a dramatic scene with heightened areas of light and shadow; the age of enlightenment made visible. These scenes of bright whites and rich blacks were nicknamed candlelight compositions and their popularity was amplified when large-scale mezzotint reproductions were printed and sold. 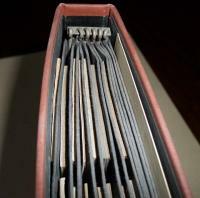 We call the artist Wright of Derby to distinguish him from artists Richard Wright (1735-ca. 1775) and Joseph Wright (1756-1793), also exhibiting around the same period. Wright of Derby’s Philosopher (Art Gallery at Derby, Derbyshire, England) presents a lecture on the movement of the planets around the sun, using a mechanical model called an orrery. The figures may represent the collector who bought the painting, Washington Shirley, 5th Earl Ferrers, along with his friends and family. The lecturer is reminiscent of Isaac Newton, whose theories on the movement of the planets and universal gravitation were published in 1687. There is a portrait of Newton by Godfrey Kneller that may have been the inspiration for this figure (http://www.newton.ac.uk/art/portrait.html). Graphic Arts’ impression of this print, along with an orrery, will be on view in the Milberg Gallery beginning February 7 in the exhibition: Envisioning the World. 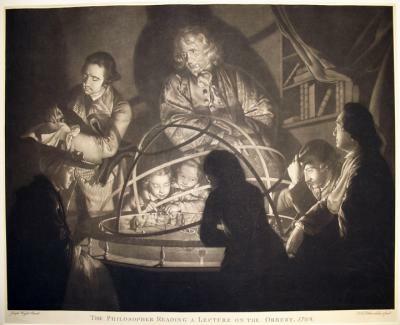 For more information, see Elizabeth E. Barker, “New Light on The Orrery: Joseph Wright and the Representation of Astronomy in 18th-century Britain,” British Art Journal 1, no. 2 (Spring 2000): 29-37. Nathaniel Currier (1813-1888), Washington at Princeton January 3d 1777, 1846. Color lithograph. Gift of Edward L. Howe. Graphic Arts Portraits of George Washington Collection. 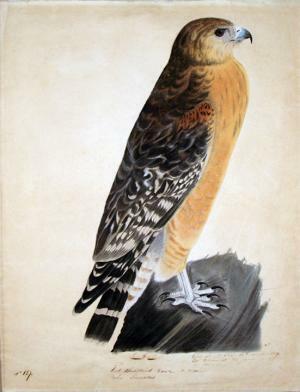 John James Audubon (1785-1851), Red-Shouldered Falcon (Red-Shouldered Hawk), 1809. Pastel and pencil. Graphic Arts GC154. Gift of Edwin N. Benson, Jr., Class of 1899 and Mrs. Benson in memory of their son, Peter Benson, Class of 1938. This pastel represents one of Audubon’s early attempts at drawing the various species of the birds of America. He began by using pastels, moved to watercolors, and the final published albums contain hand-colored aquatints. A later watercolor version (in the New York Historical Society) was used for the engraving by Robert Havell that became plate 56 of the Birds of America. The descriptive text for this plate reads: “Red-shouldered Hawk, Falco Lineatus, Gmel., Male, 1. Female, 2.; issued in 1829” as listed in Ornithological Biography, I, 296-99. 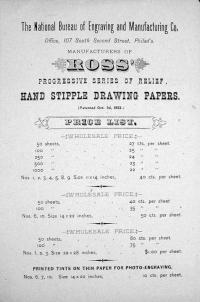 Two scrapbooks documenting the hand stipple paper business of Charles J. Ross of Burlington County, New Jersey and Philadelphia. Graphic Arts GA 2010- in process. These two scrapbooks, now in the graphic arts collection, provide a concentrated overview of Ross’s activities in the late 1880’s. Included is correspondence with artists, publishers, booksellers, lithographers, photography suppliers, zinc etchers, art stores, paper suppliers, and so on. There are also pricelists and paper samples demonstrating the variety of effects that were possible with variations of dots, horizontal lines, diagonal lines, and an overall pattern similar to an aquatint. George Cruikshank (1792-1878), after a sketch by George Arnald (1763-1841), William [James] Norris: an Insane American. Rivetted Alive in Iron, & for Many Years Confined, in that State, by Chains 12 Inches Long to an Upright Massive Bar in a Cell in Bethlem. Published by William Hone, London, July 1815. Etching with aquatint. 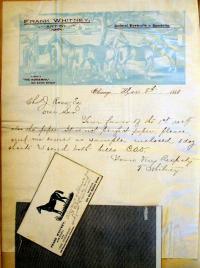 Gift of Richard W. Meirs, class of 1888. 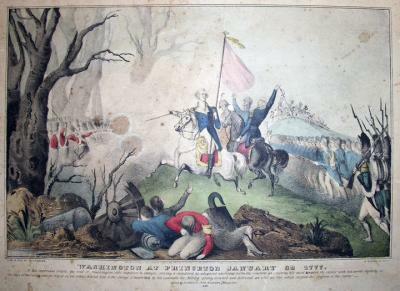 Graphic Arts GC022 Cruikshank Collection. 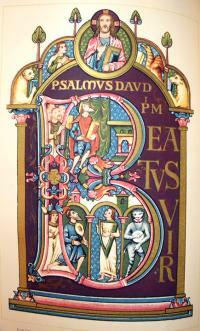 Founded in 1247, Bethlem was a priory for the sisters and brothers of the Order of the Star of Bethlehem. It was first used as a hospital in 1330 and first housed patients recorded as “lunatics” in 1403. During the 18th century, the asylum, now nicknamed Bedlam, was opened to public visitors, a penny each and free on the first Tuesday of the month. 96,000 visitors were recorded in 1814. One such visitor that year was the philanthropist, Edward Wakefield (1774-1854). He was shocked to see James (reported as William) Norris (17? 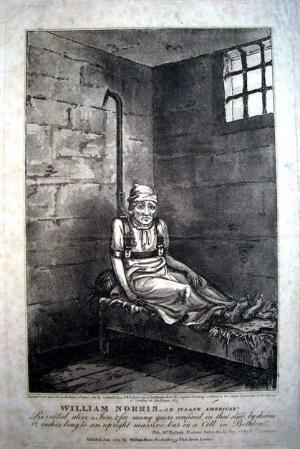 ?-1814), once an American seaman, now chained to his bed. Norris had been admitted in 1800 and so terrorized the small staff that in June 1804 he was permanently confined in an iron harness. Ten years later when Wakefield visited, Norris was still in the same spot. A stout iron ring was riveted round his neck, from which a short chain passed through a ring made to slide upwards and downwards on an upright massive iron bar, more than six feet high, inserted into the wall. Round his body a strong iron bar about 12 inches wide was riveted; on each side of the bar was a ring; which was fashioned to and enclosed each of his arms, pinioned them close to his sides. 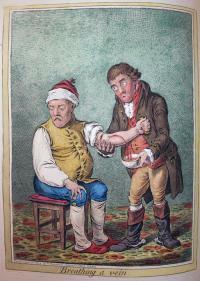 Wakefield was joined by William Hone (1774-1854) and James Bevans (1780-1842) to campaign for change in the conditions for patients, not only in Bedlam but throughout England. 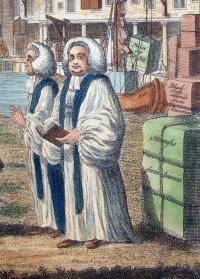 Their work led to the formation of the Committee on Madhouses in April 1815. Cruikshank was hired to etch Norris’s portrait, including the inscription: Sketch from the Life in Bethlem, 7th June 1814, by G. Arnald, Esq., A.R.A. Etched by G. Cruikshank from the Original Drawing Exhibited to the Select Committee of the House of Commons on Madhouses, 1815. 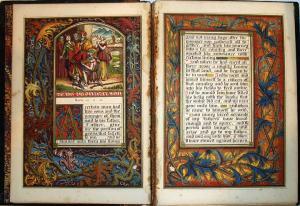 Like many Victorians, Humphreys loved all things medieval and enriched even his simplest texts with bright chromolithography printed by Owen Jones (1809-1874) to recall hand-painted illuminated manuscripts. 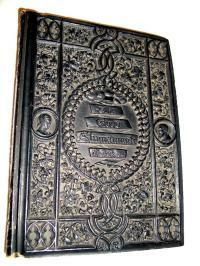 His bindings were elaborate reliefs molded in papier-mâché and painted black, imitating carved ebony. 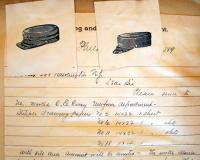 Here are a few examples from Princeton’s collections. Henry Noel Humphreys (1810-1879), A Record of the Black Prince (London: Longman, Brown, Green, and Longmans, 1849). Robert Metzdorf Collection (ExMe) ND 3410.H8. 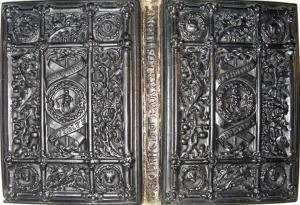 The cover is taken from one of the compartments of the Prince’s tomb at Canterbury with the coat of arms of the Black Prince in the center. The Parables of Our Lord (New York: D. Appleton, 1847). Robert Metzdorf Collection (ExMe) ND 3355.G7 B5. This retelling of some New Testament stories had an edition was 2000 with half of them sent to New York City (including this one) where Appleton added a new title page. Each of the four corners has a wreath containing the head of an angel, a lion, an eagle, and an ox representing the four Gospel authors. 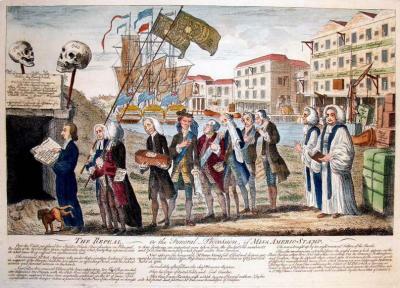 After Benjamin Wilson (1721-1788), The Repeal, or the Funeral of Miss Americ-Stamp, 1766. 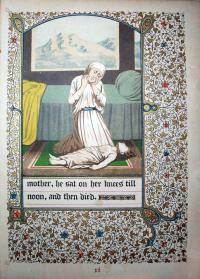 BM 4140 copy B. Engraving with etching and contemporary hand coloring. Graphic Arts GA 2010. in process. The Stamp Act of 1765 generated intense opposition with the American colonists, who called for a boycott of British imports. Needing the revenue from American trade, the British Parliament voted to repeal the Stamp Act in 1766. The Marques of Rockingham, only recently named Prime Minister, had the difficult job of convincing Parliament of the benefits of this repeal. 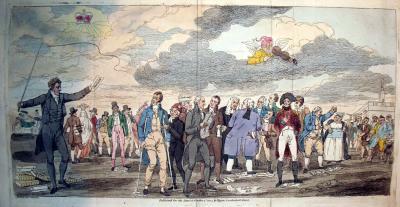 To help sway public opinion, he commissioned the artist Benjamin Wilson (1721-1788) to draw two satirical prints. The first, published in February 1766, was titled The Tombstone and showed leading “hard liners” dancing on the tomb of the Duke of Cumberland. The second, seen here, was published on March 18, the day Parliament voted the repeal. The Repeal quickly became “the most popular satirical print ever issued” according to R.T. Haines Halsey, “Impolitical Prints,” Bulletin of the New York Public Library 43, no.11 (Nov. 1939). 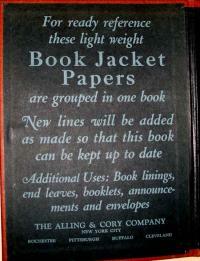 Within three days the publisher issued an advertisement requesting patience because he could not keep up with all the orders he had received. Within the week other print sellers were issuing their own versions of Wilson’s scene. According to the Dictionary of National Biography’s entry on Wilson, the print was titled “The Repeal; or, the Funeral of Miss Ame-Stamp. It was sold for one shilling and brought Wilson 100 pounds in four days. On the fifth day it was pirated, and two inferior versions produced at six-pence.” The British Museum’s catalogue identifies the original etching and six variant editions, A-F.
Graphic Arts recently acquired an excellent impression of copy B, a reduced, chiefly engraved version of Wilson’s print. 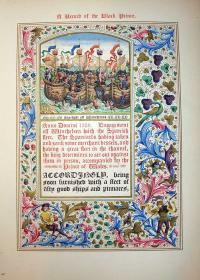 Processional figures are reproduced on the same scale as the original but the background buildings and ships are altered to fit on a smaller sheet. A descriptive text, once sold separately, is here engraved below the image along with a slightly altered title, now “Americ-Stamp”. E.P. Richardson, “Stamp Act Cartoons in the Colonies,” The Pennsylvania Magazine of History and Biography 96, no. 3 (July 1972). Continue reading The Repeal, or The Funeral Procession of Miss Americ-Stamp. Each volume of this biographical series on prominent Cincinnati men contains 125 albumen silver prints. Photographer James Landy said he spent over two years making the nearly 70,000 prints that were required for the whole edition. Mr. Landy has been exceptionally successful during his career, and many are the acknowledgments of the superiority of his artistic work which have been awarded to him. His series of seven photographs, representing Shakespeare’s “Seven Ages,” has become famous all over the world. 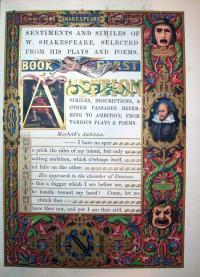 A set of these pictures, tastefully framed, adorns the walls of the Shakespeare Memorial Library in Stratford-on-Avon, and a handsome letter of thanks from the Shakespeare Memorial Association is in Mr. Landy’s possession, and treasured highly by him. At many exhibitions valuable prizes have been awarded to Mr. Landy for his excellent and artistic work. At the Chicago Exhibition of the Photographers Association of American, in 1887, he was awarded the Blair Cup for his “Man, Know Thy Destiny,” and at the Convention in 1888, in Minneapolis, his “Hiawatha” again won him the Blair Cup. Thanks to Gary W. Ewer for finding the quote. 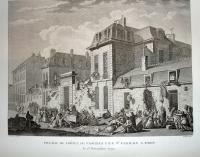 On February 19, 1796, a bonfire of money was built and then burned on Paris’s Place des Piques. The bills were assignat, the state bond used as the national currency since 1789. 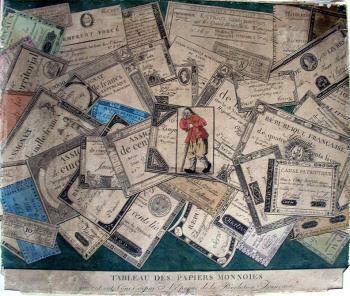 According to Richard Taws, the ritual incineration of the assignats “signaled a rupture … intended to register a self-conscious break with the past.” In the months following, a number of trompe l’oeil engravings of crumbled, old assignats began to circulate throughout Paris. The example shown here, both engraved and published by François Bonneville, shows a group of scattered bills, perhaps tossed in a gesture of despair at their worthlessness during that period of hyperinflation.